Over the last few years, the lack of diversity in classical music has become a hot topic. The industry has been called “so white and male,” and leaders, writers, and administrators of classical music organizations have declared that the future of classical music depends on addressing this issue. Yet, while many in the field have drawn attention to the homogeneity of composers, conductors, orchestra members, audiences, and more, progress in diversifying has been slow. Fortissima, a new Community Engagement pilot program here at Colburn, aims to be a part of the solution. The program promotes and supports artistic leadership and development for young women of color in classical music who demonstrate extraordinary promise on an orchestral instrument and have an interest in pursuing a career in music. This year’s cohort consists of six fellows between the ages of 14 and 17. Three of them study at Colburn, and the others come from our community partners at YOLA (Youth Orchestra LA) and ICYOLA (Inner City Youth Orchestra of Los Angeles). The program was conceived of and is directed by Jazmín Morales, Coordinator of Community Engagement and Career Development, a strong advocate for diversity in classical music. We sat down with Jazmín to discuss the program, why she feels like it’s the perfect time and place for it, and what she hopes that the program will accomplish not only in Los Angeles but also the broader field of classical music. Where did you get the idea for a program like this? A lot of this was born from my own personal experiences of being a woman of color in classical music. Something I was missing as the only person of color, but also the concertmaster of my high school orchestra, was a sense of empowerment and confidence that I could thrive in a high-level artistic environment. I remember thinking, “What is it going to be like if I really do pursue going to a conservatory? Am I going to feel even more alone?” I knew that I wanted to see more women who look like me on stage. I want these girls to know that they are within their full right and capacity to undertake those projects. At first, it started out as an idea for an agency, but I found that there weren’t enough active women of color in the field to engage at that level. Then, I thought that maybe it could be an orchestral fellowship for post-baccalaureate students of color who want to play in orchestras. But there aren’t enough students of color to even draw from at that point, because they’re not going to college music programs or major conservatories. So I landed on this age range, because I wanted to reach young women while they were still making decisions about their future and empower them to know that they can be professional artists if they choose to be, and then give them the tools to do exactly that. Ultimately, I want to see a lot of these girls go into college music programs. That’s why we say they should have an interest in pursuing a career in music, but that’s not hard and fast. Since we are trying to reach them when they are making decisions about their future, there is some definite wiggle room. I want them to pursue their dreams; that’s what’s important. But the goal is for them to know that they are not alone because they have not only each other, but their mentors, and that there are slowly more women of color coming to professionalize in this field, and they should feel confident in setting the example for others to come in. And it’s already working. Even after the first session, the girls already love each other. They’re all best friends, and they’re like, ‘Wow, there are other girls who look like me and do what I do.’ It’s incredibly empowering. Why do you think a program like this is both necessary and important today? There are 1.5 million black and Latina women living in the city center of Los Angeles, but exactly one woman in the LA Phil from an underrepresented minority in classical music. As a reflection of the community’s population, classical music looks dismal. Last year, the League of American Orchestras had two major publications on diversity in American orchestras, and the statistics have barely changed at all over the past 40-50 years. In the top 25 major orchestras in the US, less than 2% are black or Latino, with an even smaller percentage being women of color. Conservatories still largely reflect that as well. What I hope is that these girls reflect the future of classical music. I think as a field we’re slowly moving away from the conformist, rigid path to becoming a classical musician where if you want a job in a professional orchestra you have to fit a certain mold. Orchestras are starting to feel the urgency of sustaining themselves and they’re not going to do that without diversifying not just their audiences and their boards, but also the musicians on their roster. So I think they’re going to have to rethink the way they engage musicians, considering especially the needs of people of color in the field. The presence of women of color in those spaces will radically change how those organizations look, feel, and function. The goal is just to get our girls there and empower them to be change agents and leaders in the field so that they can make classical music more for them and everyone around them. How do you plan to empower these young women? This year, we’re focusing specifically on the leadership development component of the program, which has three main focuses: self and cultural exploration, mentorship, and professional development. We’re doing exercises with things like Strengths Finder, a tool that we use already in the Career Development office to help students analyze their individual strengths and weaknesses not just as people, but as professionals and artists. I’m making it a point to introduce our fellows to other women of color in the field—not just artists, but also those who empower other artists, like arts administrators. 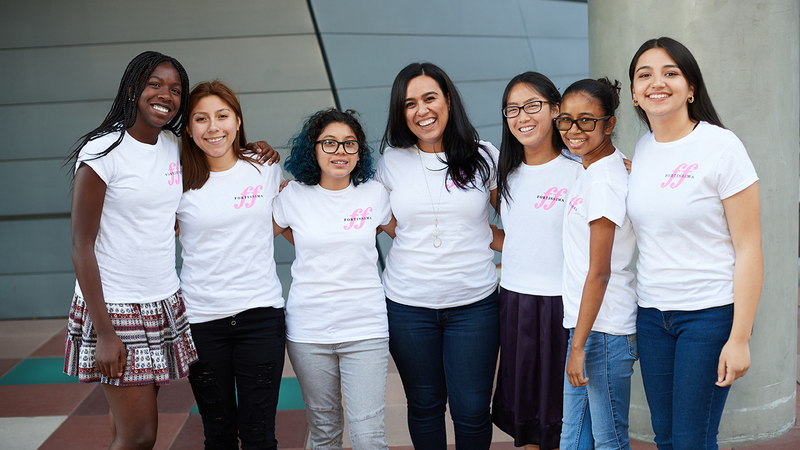 Our fellows are also all paired with mentors who are practicing women of color in the field locally, like Kroma Quartet, a string quartet based here in LA. Hopefully once the program is fully funded we can also allocate money to help girls travel to competitions, festivals, summer camps, master classes, and other opportunities like that. Cost is often a barrier for classical musicians so I want to assist them with being competitive at that level. We don’t have any seniors this year but I also want to start planning conservatory visits, and physically put them on those campuses so they can really envision themselves in that space and start feeling like they belong there. I’m fast-forwarding a lot of development that the girls might have later in life, and giving it to them upfront so that they’re ahead of the game. This is the secret tool that could help them thrive: knowing themselves, knowing their culture and history, and feeling empowered to own that and allow it to inform their artistic practice. I want them to not be intimidated or ashamed to be different, and to use that as a point of departure for excellence in their artistry. How do you think this program fits into the existing Los Angeles arts education scene? I think this program fills a gap that many community music providers are unable to address. There are thousands of black and brown kids served by organizations like YOLA, ICYOLA, Harmony Project, and Education through Music LA. All of these music providers exist, but most of the education that they provide is in group settings, so even if a student does demonstrate high promise, they’re not getting the one-on-one attention and development that is necessary to be competitive by the time they get to their college auditions. Where this program fits in is also where Colburn fits in to the larger community. We’re a place that can give almost infinite resources to anyone who can demonstrate that they’re up to the challenge. So this program is supplemental, in a lot of ways, to a lot of community music providers that are doing an amazing job at what they do, but have students who have a lot of potential to go deeper. Fortissima is where they can do that, not just artistically but within themselves, and figure out not just who they are as musicians but as artists and humans.